Lead, Kindly Light – Rev. Douglas Grandon | ADULT CATECHESIS & CHRISTIAN RELIGIOUS LITERACY IN THE ROMAN CATHOLIC TRADITION: hosting ONLY True Christians!! !, or "How to think Catholic!!" Father Doug Grandon became Catholic in 2003, after serving as a Protestant missionary and pastor for twenty-five years. In 2007, Pope Benedict XVI granted Father Doug permission to be ordained a married Catholic priest for the Diocese of Peoria, Illinois. 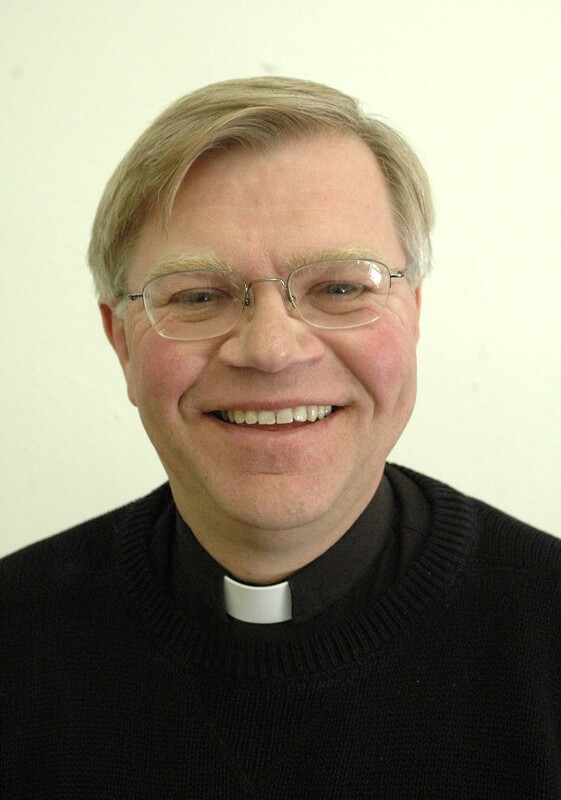 He presently serves as parochial vicar at St. Thomas More Church in Centennial, Colorado, and teaches Homiletics at St. John Vianney Seminary in Denver. “It was a bittersweet day when I left Christ Episcopal Church. I loved celebrating the Eucharist on Saturday, Sunday, and during the week. I spent hours preparing my homilies. I joyfully taught adult education, First Communion, and Confirmation classes. I enjoyed visiting my flock, especially the sick and elderly, and most especially when I could bring them communion… I had a good reputation in the community, and I was quite well paid. When I departed, I wondered, like John Henry Newman (who also converted in his mid-forties), whether the best chapters of my life had already been written. My wife and I weren’t sure how we would support our family of six. Just yesterday, an Evangelical Free Church pastor inquired over lunch about my journey from the Free Church to the Episcopal Church and on to the Catholic Church. As John Henry Newman, once noted, one’s conversion story is a bit too complicated to be quickly recounted between the salad and main course of a dinner. I became a Christian after first hearing the Gospel from a young man named Dan in a Christian coffee shop in downtown Sterling, Illinois. It was there that I was first confronted with the question, “Are you a Christian?” When I replied that I wasn’t sure, Dan arranged to meet with me every other week for Bible study and conversation. In November 1972, I prayed that Christ would forgive my sins. In February 1973, at the age of fourteen, I was baptized. During the next five years, I attended Dan’s church, a small Pentecostal church, on the “wrong side of the tracks.” The pastor was a self-taught, but serious, Bible teacher, who emphasized that God had called us to holiness and service. However, his leadership style was overly dictatorial, and he was much too confident in his ability to hear the voice of the Holy Spirit. It was in that church that I first met my future wife, Lynn, when I was fourteen, and there, at sixteen years of age, that I felt a definite call to ordained ministry. After five years in that Pentecostal church, and having completed two years of college, I was invited by a faithful missionary to spend a summer with a Protestant pastor in Belgrade, Yugoslavia, where I was tutored in Serbo-Croatian. That missionary offered to support me if I would remain in Belgrade and enroll in the Institute for Foreign Languages, which I was happy to do. For the next five years, I assisted his mission as a translator/interpreter in Communist Yugoslavia. Upon returning to the U.S., I married Lynn, completed my final two years at Bradley University in Peoria, Illinois, and then proceeded to seminary. I first earned an M.A. in Religion from Liberty University, then an M.Div. from Trinity Evangelical Divinity School, the Evangelical Free Church seminary. I was ordained in the Free Church, and started Glen Hill Evangelical Free Church in Peoria, which still exists today. During that time, I met Edward MacBurney, bishop of the Episcopal Diocese of Quincy, a committed Evangelical and Anglo-Catholic, and a godly man. We enjoyed each other’s company and met regularly for lunch. During the course of our numerous conversations, he recommended that I read Tom Howard’s Evangelical Is Not Enough. (Dr. Howard was kind enough to meet me one day for breakfast in Wheaton.) Bishop MacBurney convinced me that my Evangelical experience was deficient. Several points of Catholic theology became clear to me at that time: apostolic succession, the Real Presence of Christ in the Eucharist, the role of saints as mediators, the value of liturgy, the sacrifice of the Mass, etc. My early Pentecostal experience had infected me with a strong prejudice against the Catholic Church. To overcome this, God led me into the Church in short steps, from Pentecostalism to mainstream Evangelicalism, and across the bridge of Anglicanism. To this day, I am grateful for each of those churches. When the timing was appropriate for me to leave my Evangelical Free Church, I became Episcopalian. Bishop MacBurney made it very clear to me that the Episcopal Church was rapidly abandoning its Catholic and biblical roots. I was aware, however, that the worldwide Anglican Communion included a strong Evangelical wing, which was profoundly committed to evangelization, good preaching, holy living, and serious academic work — and that Anglo-Catholics still defended those Catholic convictions championed by John Henry Newman, prior to his conversion to Catholicism. I felt comfortable exploring the Catholic tradition in a church populated by such Evangelical leaders as Alister McGrath, Jim Packer, and John Stott. During my Anglican years, I completed my doctoral course work at St. Louis University. With my doctoral advisor (a convert himself), I engaged in a serious reading of Newman. With his help, I began to understand the profound importance of Newman’s Essay on the Development of Christian Doctrine. (Development was the answer to sola scriptura, which seemed more and more untenable.) My dissertation research on Flacius Illyricus, an immediate successor to Luther and the first Protestant historian, reinforced my doubts about Protestant separation from Rome. In preparation for ordination to the Anglican priesthood, I was sent to Oxford for a year of postdoctoral theological study. Oxford was fantastic. However, at St. Stephen’s House, I witnessed firsthand the serious degeneration of the Anglo-Catholic movement. I was shocked that the principal allowed a practicing homosexual to remain in residence and was admitting women, who would eventually be ordained to the priesthood. My Episcopal bishop, Keith Ackerman, allowed me to transfer to Wycliffe Hall, the Evangelical Anglican college, on the other side of Oxford. Scholarship was much more serious there, as was an Evangelical commitment to the faith. Wycliffe Hall was marvelous in many ways, although sacraments, episcopacy, and other Catholic hallmarks were given minimal attention. As Bishop Ackerman later observed, I was a faithful and obedient Episcopal priest. Nevertheless, I began to question the validity of Anglican orders, which, of course, directly led to doubts about the validity of Anglican sacraments. For me, the fundamental problem was neither the ordination of women nor the toleration of homosexual practice. Most fundamentally, I could no longer confidently assert that Anglican orders were valid. As a result, I contacted Bishop Daniel Jenky, who had been recently ordained as Ordinary for the Catholic Diocese of Peoria, to whom I expressed my desire to take concrete steps toward entering into full communion with the Catholic Church. For a number of years, I had been reading Catholic authors and the Church Fathers. In Oxford, I had met an elderly French Jesuit at a Newman Conference who kept in touch, encouraging my conversion and my application for Catholic priesthood. Also in Oxford, I had heard lectures that offered a revisionist (and true!) explanation of the nature of the English Reformation. Others were also quite helpful, including a Catholic, former undergraduate professor, several Catholic priests in the Dioceses of Peoria and Davenport, and numerous Catholic laymen active in the pro-life movement. It was a bittersweet day when I left Christ Episcopal Church. I loved celebrating the Eucharist on Saturday, Sunday, and during the week. I spent hours preparing my homilies. I joyfully taught adult education, First Communion, and Confirmation classes. I enjoyed visiting my flock, especially the sick and elderly, and most especially when I could bring them communion. We had just completed a large addition to our church building, without incurring debt. I had a good reputation in the community, and I was quite well paid. When I departed, I wondered, like Newman (who also converted in his mid-forties), whether the best chapters of my life had already been written. My wife and I weren’t sure how we would support our family of six. My wife, our four children, and I entered the Church at a vigil Mass at Sacred Heart Church in Moline, Illinois, on the Feast of the Sacred Heart in 2003. My first year in the Church, I was blessed to serve as spiritual director and chairman of the theology department at Assumption High School in Davenport, Iowa. At the end of that year, Bishop Jenky appointed me the director of the office of catechetics for the Diocese of Peoria, where I served with great delight. In September 2006, I traveled to Immaculate Conception Seminary in the Archdiocese of Newark, for the seven initial examinations required by the Pastoral Provision for former Anglican clergy. In November 2007, the Congregation for the Doctrine of the Faith officially notified Bishop Jenky that they were “positively disposed” toward my candidacy for priesthood. In February 2008, I successfully completed the final written and oral examinations on the seven subjects. On April 18, the Congregation authorized Bishop Jenky to proceed with my ordination. On May 24, 2008, Bishop Jenky ordained me, along with five seminarians, to the Catholic priesthood. (Three of the six are former Episcopalians, although I am the only former Episcopal priest/minister.) I then served as parochial vicar (associate pastor) at Sacred Heart Church in Moline, where I was received into the Church.